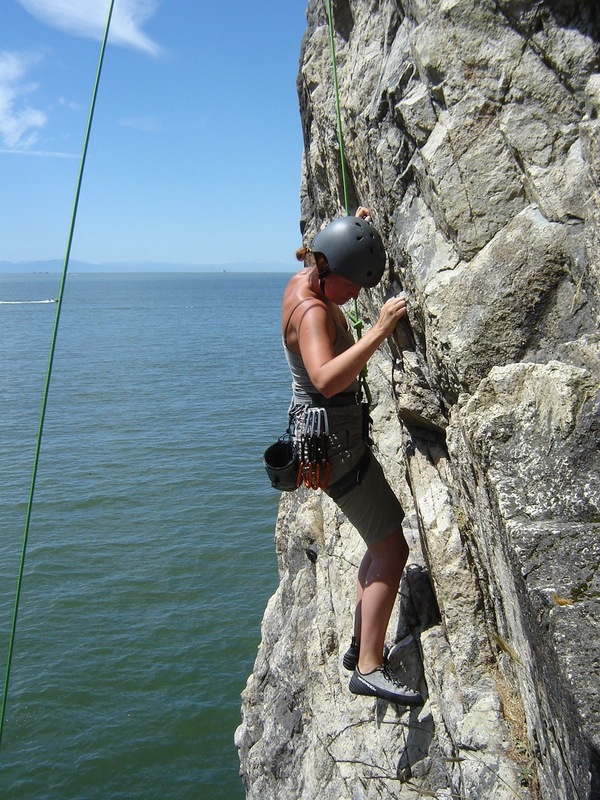 Rock climbing is a great way to test your self physically and mentally! So, you want to learn to rock climb, eh? Well you’ve come to the right place. In this post we will ensure you ease your way into the sport without getting too financially invested from the get go. There is an exhaustive amount of information on rock climbing out there; on the web and in books, but I will try my best to condense it into what you need to know as a beginner in order to learn the rest on your own. As a new climber the climbing gym is your best friend. Without spending hundreds on gear and guiding or instruction, you can give climbing a try and see if you fall in love. You’ll also be exposed to hundreds of climbers who are in love with the sport. So go to a gym a few times (expect to pay around $25 each time including equipment) and see what you think. Don’t be intimidated by the equipment, the terminology, or all the really good climbers there. Everyone was a beginner once and most climbers will be excited to show you the ropes (pun intended) and get you psyched on the sport. After you’ve gone to the gym once or twice a week for a month or so and you still find it amazingly fun, then you’re ready to take the financial plunge of buying a pair of shoes (~$100), a climbing harness (~$50), and maybe even a gym membership ($30-$70/month). It is now also time (if you haven’t already) to climb outside. Climbing outdoors is very different from climbing in a gym and can be much more rewarding. There isn’t any bright colored tape to follow, the holds are hard to distinguish from the rock around it, and the ground isn’t soft and cushy; basically, climbing outdoors is scary and hard. To get outdoors you may be able to meet some seemingly experienced climbers in the gym who offer to take you (somewhat risky, choose wisely), or you can ask about trips that your local gym may organize to nearby climbing areas, if both of these options are a bust you can get a list of certified guides at the American Mountain Guides Association website (hireaguide.amga.com) and pay them (around $150) to take you climbing for the day. Don’t get too frustrated if you struggle to make it off the ground; remember, climbing outdoors requires a lot of new skills you haven’t learned yet. Enjoy the challenge, test yourself, and soak up the great outdoors from your unique perspective high off the ground. So now you’ve been practicing the basics of movement and technique while climbing indoors, and you’ve experienced the challenges of climbing outside. Still psyched on climbing? Of course you are. It’s time to start thinking about where you want to go with your climbing. Do you want to spend time in nature while challenging yourself physically and mentally? Do you want to be the most badass climber in the gym, screaming as you grab each hold? Do you want to participate in climbing competitions? Or, do you just want a fun way to get some exercise? Some climbers are happy to spend their whole careers in the gym, never setting foot on real rock. Others avoid the gym like the plaque only succumbing to its convenience for training during the winter. If climbing outdoors blew your mind as it did mine, then you may want to start seeking some instruction on setting up anchor systems. Good resources include books and the internet, classes at your climbing gym, a local guide service, or best of all, a trusted climbing mentor. No matter your climbing goals remember to have fun. If you lose motivation to go climbing, don’t force yourself, or let anyone else force you, to go. Even the best climbers in the world lose motivation and take some months off. Eventually you’ll feel like going again and you’ll fall in love with the sport all over again. A few closing comments. While being super strong will help your climbing, technique is massively more important. You can make significant improvements in technique (and climb harder grades) in a week, but gaining strength, especially in the unique muscles and tendons used in climbing, will take years. Avoid spending time at the gym doing sets of pull-ups or trying the hardest routes until your elbows hurt. Get on routes that are easy for you and practice them to perfection, meaning you spend the least amount of energy to make it up the wall. Watch experienced climbers and study how they seem to flow up the wall making it seem effortless, ask them to watch you climb and give you pointers, they’ll be more than happy to help. I hope this guide will help you get you started in the amazing sport of climbing. Have fun, be safe, and get outside! Be sure to leave a comment with any questions or feedback!